A man named Harry walks into a café. 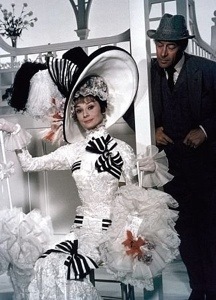 Eliza Doolittle, who is working in the restaurant as a waitress, greets him in her dire cockney accent, “Ari”. He orders a slice of cake with layers of sponge, cream and forest fruit: a “gateaux”. When Elisa brings over his order, Ari looks at the gateaux, and says “thank you”. Ari-gatou – you’ve just learned how to say thank you in Japanese through mnemonics: memorisation strategies inspired by the ancient Greeks and endorsed by memory champions as the most effective way to quickly remember large amounts of information. Memory virtuoso Joshua Foer reports on the benefits of using these techniques for learning vocabulary in his article “How I learned a language in 22 hours”, after setting himself the challenge of learning Lingala for his field trip to the Congo. Joshua worked on his vocabulary using memrise, a slick on-line game which draws from mnemonics to optimise memory power. It may come as no surprise that the US memory champion cruised through his vocabulary sets. But before practising these techniques, Joshua, along with many other “memory athletes”, described himself as having only an average memory. In the words of British memory champion, and co-creator of memrise Ed Cooke, “anybody can do this”. So worry not if you can’t remember where you put your keys, or your car, you can never put a name to a face and you once left your child at the supermarket: mnemonics might just work for you. Learning vocabulary is an enormous undertaking. In their native language, college-educated English speakers are estimated to possess a whopping 60, 00 word vocabulary (Pinker 1994). Children between the ages of one and six act as “lexical vacuum cleaners”, picking up around 9 to 10 words per day (Pinker 1994; Bloom 2000). If you’ve ever set yourself this familiar target for learning a foreign language, you’ll realise what a cognitive challenge this is. Yet children do it with finesse, without dictionaries, word lists or fancy apps. The difference between adult and child vocabulary development recalls the age-old nature vs. nurture schism which has been causing bloodthirsty brawls between meek and mild academics and sending hungover undergraduates to sleep for centuries. The nativist camp (e.g. Pinker; Markman) argue that babies are born with an innate ability to learn vocabulary which fades as the maturation process kicks in, leaving adults at a cognitive disadvantage. Alternatively, empiricists (e.g. Snow; Bates; Tomasello) emphasise social and contextual differences: adults often receive less (and different) exposure to the second language, cognition may be biased towards first language settings and adult inhibitions may hinder vocabulary development. Putting aside linguistic fisticuffs about how our brains are wired, all approaches agree that learning vocabulary is a formidable challenge: any techniques which assist in memorisation are a welcome addition to the language learner’s tool box. The site memrise takes advantage of mnemonics by linking new vocabulary items to images, rhymes or anything memorable about the word. Learners are encouraged to visualise the details: “the stranger the imagery, the more markedly memorable it is” – think Eliza Doolittle with a blackforest gateaux in hand. To help adults overcome their fear of vocabulary lists, creators Ed Cooke and Princeton neuroscience PhD Greg Detr drew from principles of social gaming to make studying “so fun, so secure, so well directed and so mischievously effortless that it’s more like a game – something you’d want to do instead of watching TV”. What’s more, with a smartphone these games are completely mobile: time spent stuck in traffic refining your road-rage vocab could be put towards more useful linguistic prowess. In the supermarket, instead of deliberating whether to move to a shorter queue (or take out the granny at the front with a tin of beans), you could be serenely buffing up on how to order a cocktail in Spanish. Designed to be played in short bursts, the game is based on time-honoured principles of human cognition: studies show that the most effective way to commit something to memory is through “spaced repetition”, where information is encountered in short repeated sessions spaced out over a relatively long period of time. True to form, Joshua learned the 1000 most common words in Lingala in short 5 minute bursts, totalling 22 hours over a space of 10 weeks. Amazingly, upon arriving in the Congo, Joshua was able to converse with the natives in a simple exchange about family and friends. Not a bad result from playing the linguistic equivalent to angry birds for a few minutes a day. Admittedly, when it came to communicating more complex information, he was lost for words. So can mnemonics help you learn a language in 22 hours? Probably not. But they can do wonders for your word power. Do you use any mnemonic techniques in your teaching? Can you think of any activities to encourage students to use mnemonics, either in the classroom or at home?